The modern smartphone is a wonder of modern technology, and in combination with the carrier network can allow you to make calls from the densest urban jungle to Mount Everest. But despite the amazing global coverage of the carrier networks, sometimes it just isn't enough.This is when you need to rely on satellite coverage. And believe it or not, you can add satellite communication apps to your existing sat phone. Yes, that's right, you no longer need to search for a great app – we have Satway Pro for you today. 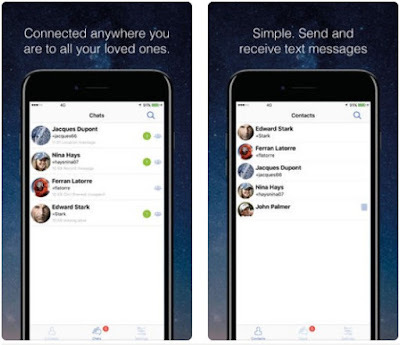 Satway Pro is an online messaging service for all satellite phone users that want to connect with their friends and family via an Android and iOS app. The app is secure, convenient, easy to use and beautifully designed – providing tons of communication features. Let’s talk more about those features and functionalities. Like we said, Satway Pro is a feature-rich app. It offers a two-way communication, via text and voice messages, and geolocation anywhere on the planet. It works with Inmarsat, Iridium and Thuraya satellite phones within their coverage areas. All messages and data location are sent with a satellite terminal over these reliable networks. To send your geolocation, you have to send a message with your GNSS position coordinates; your guest users will receive the position with a map icon. To send voice or text messages, all you got to do is write a text message, call and record a voice message or acquire a GNSS position on the satellite phone and transmit it to Satway Pro number. Choose to send messages individually or with a group (with up to 10 people) and make your messages public or private – it’s up to you. You can try out Satway Pro’s 30 days trial for free, but make sure you visit its official website for more useful info. Download the app for free from Google Play or from the App Store and enjoy.